"LIVE SCORES", the very first MULTISPORTS application, voted Best Application in the Sports category at the Best App Ever Awards, is now available on Windows Phone! 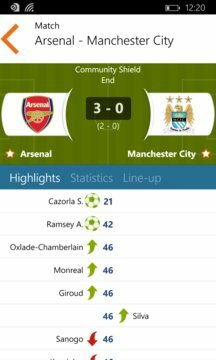 SportyTrader's totally FREE "LIVE SCORES" application is the most COMPREHENSIVE application and the FASTEST LIVESCORE service, allowing you to follow sport anywhere and at any time! Download it now! Follow all the scores for FOOTBALL, TENNIS, BASKETBALL and lots of OTHER SPORTS live on your mobile - right now! Try out our free 100% SPORTS application! To benefit from all of these great features, download our "LIVE SCORES" app - the no. 1 multisports application for Windows Phone! INSTALL our Live Scores application for FREE and don't miss another moment of your favourite sports!